Boat Trailer Accessories | Boat Trailer Keel Roller Assemblies | VE-VE Inc. NOTE: These Keel Roller Assemblies are QUALITY AMERICAN MADE Products, and you DO get what you pay for! T-950 ;5” Keel Roller W/Brkts. The T-950; Keel Roller W/Brkts. 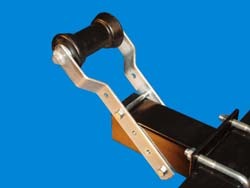 is 1 pair of adjustable Brackets that mount on a 3" Wide tongue or frame to hold 5" Keel Roller for keel support. T-952; 4” Keel Roller W/Brkts. The T-952; Keel Roller W/Brkts. 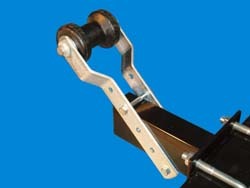 is 1 pair of adjustable Brackets that mount on 2" Wide tongue or frame to hold 4" Keel Roller for keel support. Complete 4” Keel Roller and Bracket. Mounts on 2" to 3" wide tubes. Used to provide support and guidance for boats keel. Complete 4” Keel Roller and Bracket. Complete with mounting fasteners ( 2ea. 3/8"-16 x 4" long tap bolts, 1ea. 3/16" x 1-1/4" x 5" lg. clamp bar & lock nuts ). 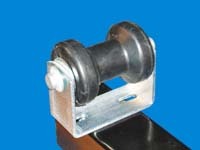 Mounts to tubes 2" to 3" wide & up to 3" high to provide support and guidance for boats keel. NOTE: Complete with Mounting fasteners not shown in this picture.